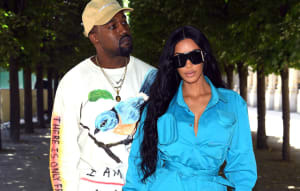 The two are allegedly “pals” of TMZ reader Donald Trump Jr.
Kanye West met with Turning Point's Candace Owens and Charlie Kirk on Sunday, TMZ reports. The meet-up comes a little over a week after West tweeted that he "loves the way" Owens, a prominent far-right personality, "thinks." According to TMZ's sources, West hopes the meeting will jumpstart a "movement." According to Owens's Instagram, the meeting took place on her birthday. A few days early, Kirk, seemingly new to being a fan of Kanye West, misquoted West's lyrics on his own Instagram, just after the rapper tweeted support for his conservative group's communications director. On Monday, the president's son, Don Jr., tweeted a paparazzi photo of the meeting, writing "Woah, looks like my pals @realcandaceO and @charlieKirk11 hanging with @kanyeWest yesterday." He was not invited to the meeting, and appeared to find out about it from TMZ. Thumbnail image courtesy of Drew Angerer/Getty Images.